We focus so much on Google and quite frankly, you'd be silly not to right ? Anyone who's anyone knows that getting seen online means playing nice with Google. This has to be a big part of your ranking strategy. Whether your website is traditional or focused more on the mobile crowd or a combination of both, Google is important in your overall bottom line. Up until recently, Google has been the exclusive search engine for mobile. 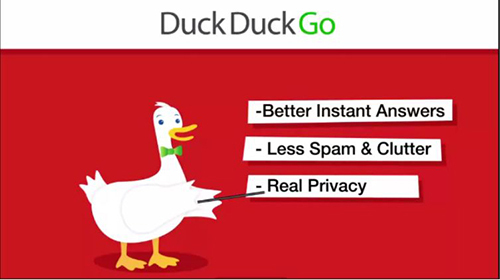 Duckduckgo is a new up and coming search engine that will be available to users on the Apple iPhone through iOS8. You might say, well how is this a relevant topic here. It's relevant because mobile search is right on par with non mobile search which means there's a ton of eyes potentially on your website on mobile if you are found on a search engine using a mobile device. Since millions of people already own iPhones and are searching for content daily using that device, you can be sure that a large segment will if nothing else give the new Duckduckgo search engine alternative a try. So how do you get found in Duckduckgo ? The best advice I can give is to do the same things you would do to get into any other search engine. Best practices still apply even if this is a new search engine. 1. Make sure you link to and get links back from websites that are, "high quality", "high trust" and "relevant". It still remains to be seen what the future holds for Duckduckgo and mobile, but now is a great time to prepare for the release of iOS8 and the introduction of this new hybrid search engine.